One of the most sad and paradoxical facts of the Christian sub-culture is the way in which the one who was sent to draw us to Jesus (and therefore, I take it, towards unity) has actually become the cause of division amongst Christians who have different understandings of His role. 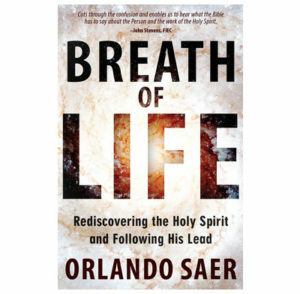 Any book, then, which aims to shed some light on the person and work of the Holy Spirit is always a welcome arrival, so I was delighted to receive a copy of Breath of Life to review. Orlando’s approach, as you might expect, is to go back to the Bible and seek to draw out the Scripture’s teaching in this vital area. In order to do so, he takes us right back to the beginning so that we can understand the Spirit’s role in the context of the whole of Salvation History – a helpful corrective for anyone who wants to focus only on the dramatic works of the Spirit we read about in the New Testament. The Spirit didn’t appear at Pentecost – He has existed for all eternity past as part of the God-head and in order to understand His role we must trace His work through the whole Bible story. The book develops a traditional conservative evangelical theology of the Spirit. And one of its great strengths is the way in which Saer engages with many of the touch-points of a more charismatic theology. In simple, straightforward language he tackles questions such as what it means to be ‘baptised in the Spirit’ or to ‘pray in the Spirit’ or to be ‘filled with the Spirit.’ He engages with the idea of ‘Signs and Wonders’ and whilst taking a far from cessasionist position, he is certainly cautious about claiming too much too soon, in a world which Jesus and the Apostles all characterised by suffering and perseverance. Breath of Life was an easy book to read – short (only 142 pages long) and written in a light and engaging style. It is liberally and well illustrated – though if I had a tiny criticism it would be that some of his illustrations are quite culturally bound. As a Biblical introduction to the person and work of the Spirit I would thoroughly recommend it – and will be offering it to new Christians who may need some help in this area. But it will also be of benefit to those who are already persuaded of the conservative position but would appreciate a brief reminder of why they believe some of the things they do – in the face of that nagging sense that they are ‘missing out’ compared to their charismatic brothers and sisters! There is a helpful emphasis on appreciating the miraculous work of the Spirit in anyone turning to Christ, and a right encouragement to follow His lead in our everyday life. So buy it, read it, and keep in step with the Spirit (Galatians 5:25). Breath of Life is available at Amazon. (Many thanks to Orlando Saer for providing the review copy).